Not only is shopping more digital than ever–it’s also more social. Mobile-first shopping grew by 20% from 2016 to 2017 and in 2018, consumers ranked social as their number one source of inspiration for purchases. Retailers know it’s never too early to start planning holiday social media campaigns, and recent years’ trends only further support those strategies. Compared to an average of 1,768 messages received per day by retailers in January through October 2017, retailers received an average of 3,385 messages per day in November and December 2017—that equates to a 92% increase in average messages received a day during the holiday season. Data also shows the socially-engaged retail season begins ramping up as early as Q3, when back-to-school shopping swings into high gear, with an average of 2,005 messages per day. 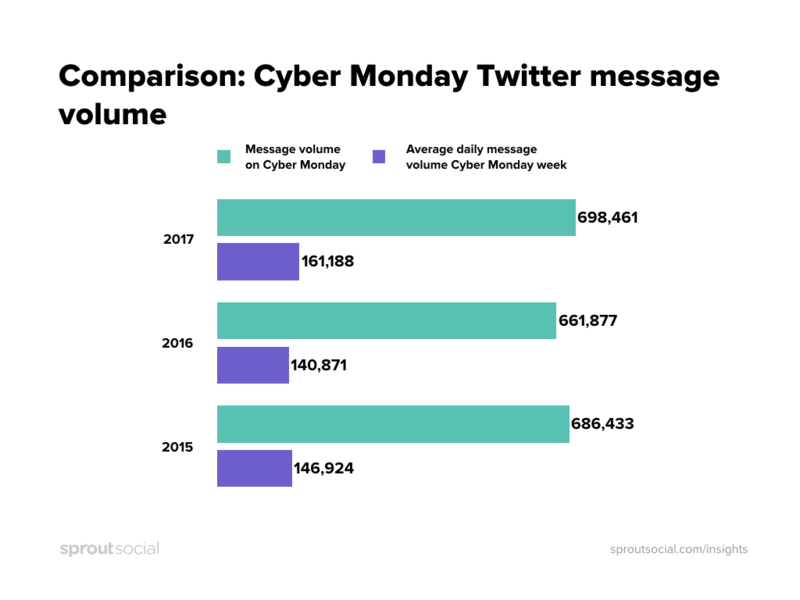 Social messages during the 2017 holiday season also grew significantly across most segments, serving as a reminder for retailers of all sizes to stay present and active on their social channels even as the year winds down. Small retail businesses (50 employees or less) received an average of 925 messages a day in November and December 2017. Mid-market retail businesses (51-1,000 employees) received an average of 5,229 messages a day in November and December 2017. Enterprise retail businesses (more than 1,000 employees) received an average of 6,055 messages a day in November and December 2017. When it comes to the various social platforms, Facebook continues to be the platform of choice for consumers looking to interact with retailers. 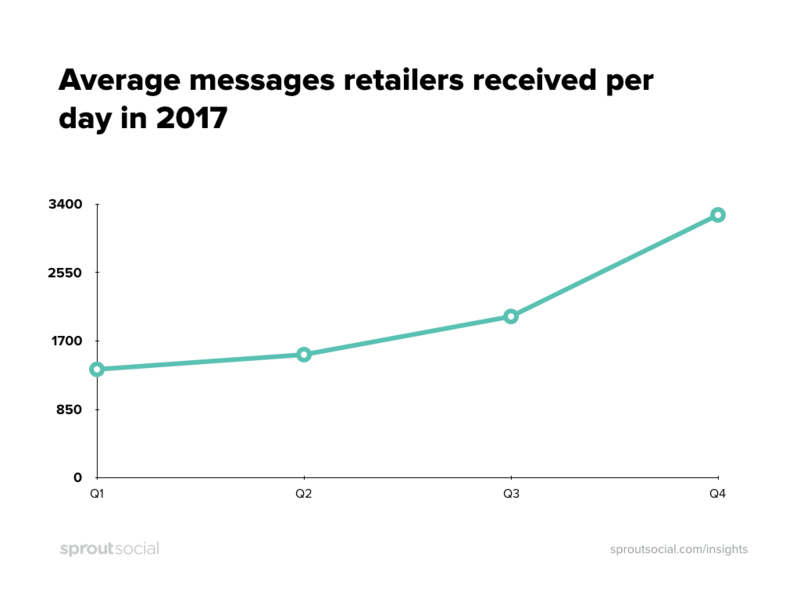 In fact, the number of Facebook messages retailers received per day on average grew 83% in 2017 compared to 2016. Looking specifically at holiday 2017, the numbers only increase, with retailers receiving nearly double the amount of Facebook messages per day on average in November and December than in January through October 2017. However, this doesn’t mean retailers can afford to shift attention away from other platforms. Instagram in particular saw explosive growth during the 2017 holiday season. Fueled by features such as “swipe up” and “shop now” ads, consumers are increasingly turning to this highly visual platform for their shopping needs. 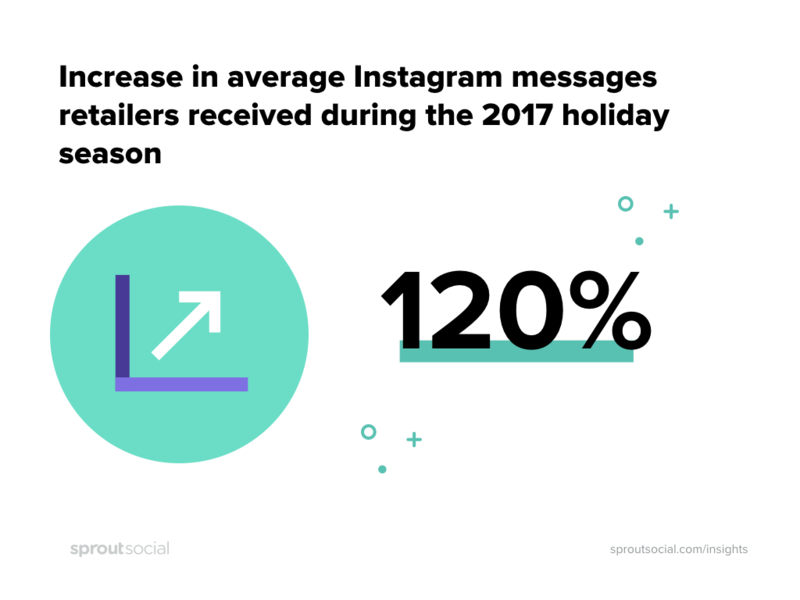 On average, retailers received 120% more Instagram messages per day in November and December 2017 than 2016. Last year was the best holiday season for retail sales since 2011, and much of that growth occurred through mobile ecommerce. Since consumer attention is already on mobile screens to catch exclusive deals through a variety of retail websites and apps, it’s becoming second nature to jump over to social and continue researching and posting about holiday finds. With this in mind, the need for retailers to prepare their teams for the holiday message influx and develop more sophisticated holiday social media campaigns has never been greater. It is becoming more difficult to cut through the noise on social around the holidays and 2018 will be no different. 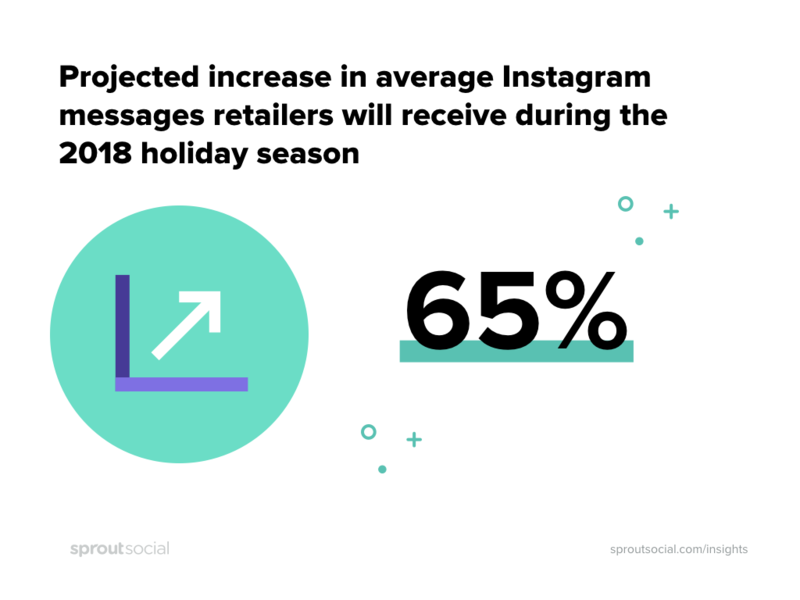 The Sprout data science team projects retailers can expect on average 32% more social messages per day this holiday season than they did in 2017. 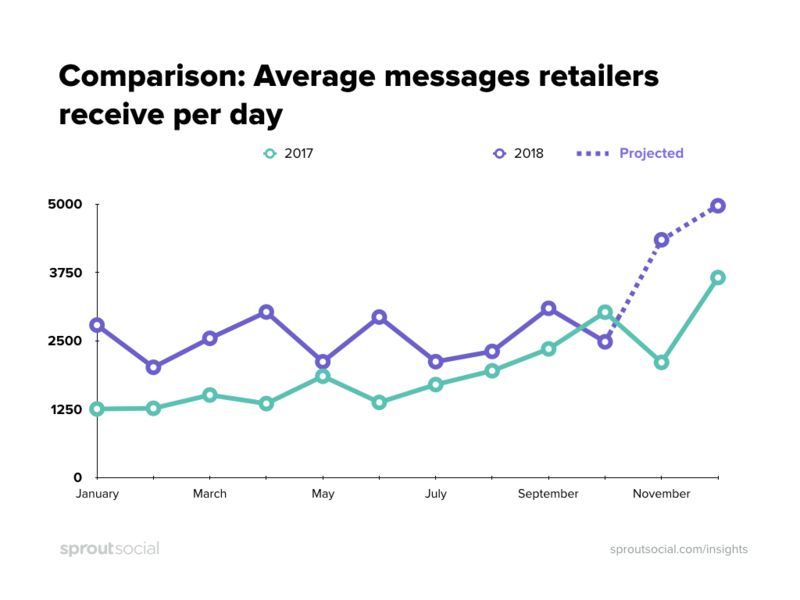 In terms of how the 2018 holiday season stacks up with message volume so far in 2018, the team projects retailers will see 75% more messages per day this November and December than what they’ve seen so far in January through October 2018. Breaking the numbers down by business size, this translates to a projected increase in messages received across the board for retailers during the 2018 holiday shopping season. From a mom and pop shop to a global brand, retailers can make the most out of increased visibility this holiday by leveling up their social strategy. Digging in by segment, it’s not enough for small businesses’ social strategy to simply publish deals and gift ideas. Without engaging their audiences, small businesses will miss the opportunity to create the connections that build loyalty and repeat purchasing. In the mid-market segment, social marketers might have the basics covered when it come to engagement, but now is the time to double down on holiday campaign messages and leverage creative social activations to stand out from the crowd. Furthermore, the more your business grows, the less patience consumers have for slow or lacking responses on social. Make sure your social team is equipped to handle the increased volume of messages by following social customer care best practices. Looking to take it a step further? Enterprise businesses especially can benefit from a robust social listening strategy to tap directly into what customers and competitors are saying, and glean advanced insights to craft a more targeted approach. While Facebook is expected to be the leading social platform in messages received by retailers yet again, Instagram is still a force to be reckoned with as it is on track to lead the social platforms in growth for a second year in a row. 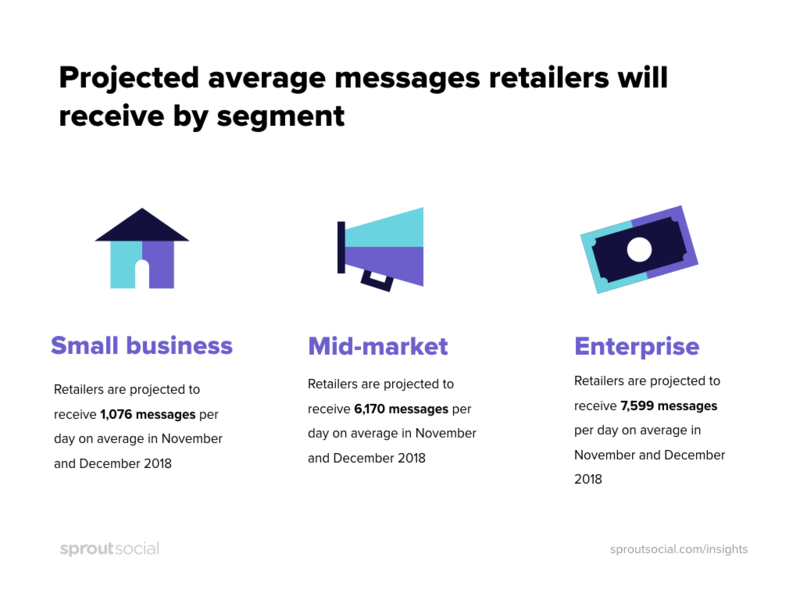 The Sprout data science team projects retailers will receive 65% more Instagram messages per day on average in November and December 2018 compared to 2017. And while it’s clear social marketers will be pressed for time with these increases, tinkering with both paid and organic strategies will give brands an extra boost in penetrating the market with their holiday messages. Pair that with an Instagram stories strategy which creates enviable online experience and prompts action by consumers, retailers will be positioned well for the best holiday season yet on social. Of course, all businesses are unique and understanding where your audiences are and what their needs are should be step number one in a successful social strategy. Although online shopping habits have evolved and led to sales that are diffused throughout the holiday season, there’s no doubt Black Friday and Cyber Monday are still major tentpole events. There are high concentrations of users online on each of these days tracking and posting about deals—or simply updating friends and family on their shopping experiences. 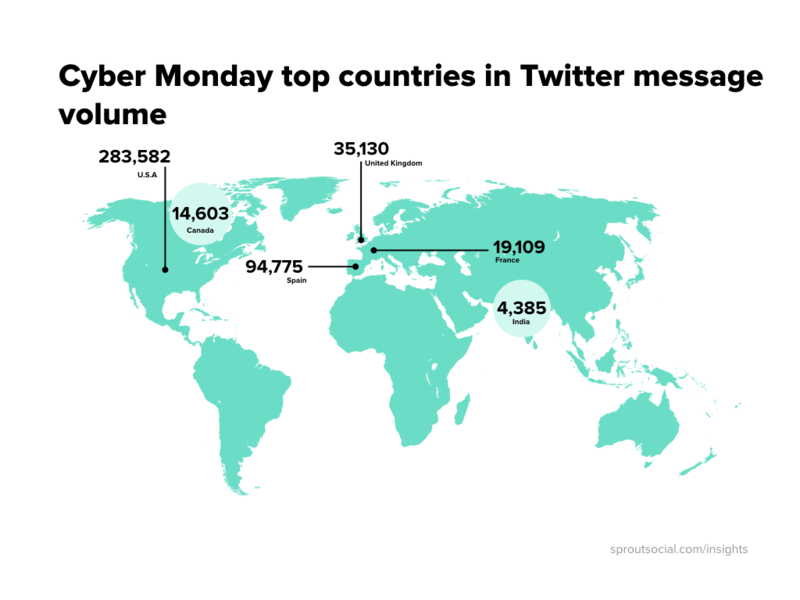 Using Sprout’s listening data to hone in on Twitter conversations during Black Friday and Cyber Monday for 2015, 2016 and 2017, Sprout found there’s no shortage of chatter around these special shopping days. 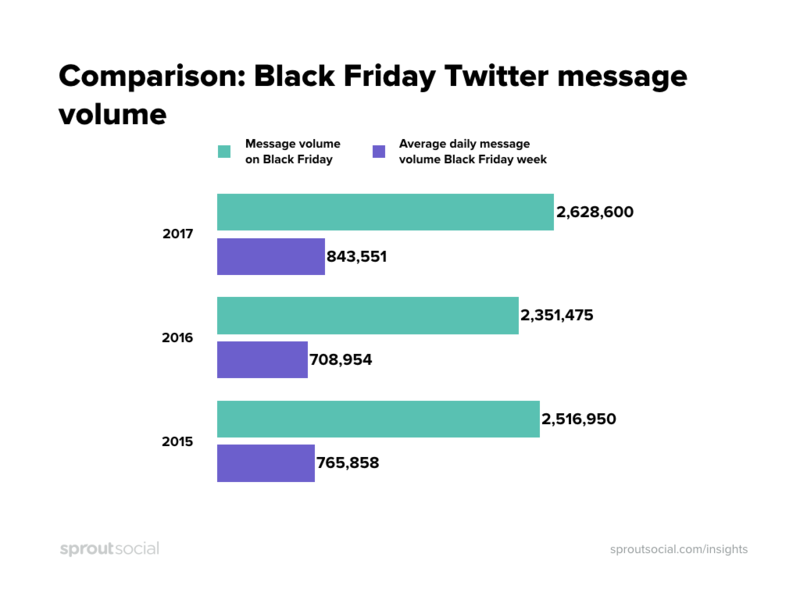 Comparing Twitter messages in the charts below on Black Friday and Cyber Monday to the average daily message volume from each corresponding week, it is clear that even though consumers may be extending their shopping season, they’re still highly tuned in to these one-day events. And despite revolving around the U.S. Thanksgiving holiday, Black Friday and Cyber Monday have also become a global shopping event. The UK, Brazil, Canada and France have all seen consistent Twitter engagement over the past three years on these days. Finally, while Black Friday and Cyber Monday get a fair amount of negative press each year, consumer sentiment is still generally favorable. Of the Twitter posts analyzed on Black Friday and Cyber Monday, about 25% had a discernible positive or negative sentiment. Out of these, about 60% of Tweets showed positive sentiment for either holiday throughout the last three years—so it looks like excitement for these sales isn’t going anywhere soon. Retailers know how important the lead-up to holiday is for planning and executing on marketing campaigns and promotions. Take advantage of the fact that customers are ready to shop this time of year, and use social to drive offline sales. Download our free guide here. But beyond sales, your approach to social engagement and customer care across platforms is crucial during the busiest shopping season of the year. Make sure you’re giving your customers what they want for the holidays: compelling social content, great deals and real-time social responsiveness to tie the experience up with a bow. All referenced data on social messages received and projected is based on 861,000 public social profiles (231,000 Facebook; 504,000 Twitter; 126,000 Instagram) of active accounts between January 1, 2015 and October 31, 2017. More than 2.9 billion messages sent and received during that time were analyzed for the purposes of this report. The 2018 holiday message volume was estimated via segmented year-over-year and year-to-date ratio projections. The messages analyzed included Facebook posts and Tweets directed to a brand via tagging or @message, posts and business reviews on public Facebook pages, comments posted on brand-created Facebook and Instagram content, and retweets with comments. 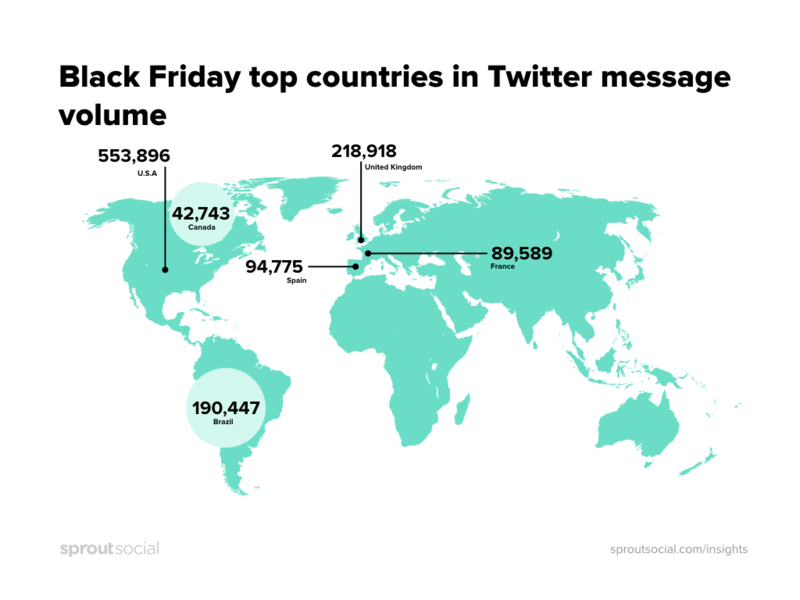 Black Friday and Cyber Monday data was pulled from publicly available, global Twitter data using the Sprout Social platform. Learn more about Sprout’s social listening offerings. If you’d like to use the charts from this report, you can download them here. For questions about the data, please contact pr@sproutsocial.com.